The Royal Clipper is the first fully rigged square-rigged ship with five masts since the Preussen, launched in 1902, one of the last sail powered bulk cargo ship. The Preussen was then the largest and fastest sailing vessel ever built. Today, the Royal Clipper approximates the Preussen in all major measurements, but is optimised for passenger comfort rather than cargo carrying, and the overall look of the new vessel is based upon the former German sailing ship. At 133.8 meters length the Royal Clipper is by far the largest true sail vessel afloat anywhere today. She accommodates 228 passengers and 105 crewmembers, and has three swimming pools, a stern marina platform, a spa and a three deck combined atrium and dining room. Michael Krafft is the owner of Star Clippers. He got his first job when he was 6 years old carrying varnish in a shipyard near his home in Sweden. Later he became a maritime lawyer in Sweden and France, and much later founded the White Star Group in Belgium. This company commissioned the design and construction of the first two sailing ships of the Star Clippers branch, the four-masted square-rigged 170 passenger barquentines Star Flyer and Star Clipper, in the early nineties. But Kraft had even more ambitious plans and ten years later commissioned the five-masted square-rigged Royal Clipper. Everything on board is designed so that all passengers can feel the power of the sails as they capture the energy of the wind. Standing on the top deck, the wind blowing nice and steady, all square sails unfurled, is an unforgettable experience. The Royal Clipper usually sails totally under sail power, without engines, as opposed to other "sail" cruises that are almost always under engine power along with sails. The Royal Clipper is the flagship of Star Clippers and, as well as her two former fleet mates, is built to high safety construction and rigging standards. The steel hull vessel carries the highest rating possible +100 A1. She is registered in Luxembourg. The ship has a crew of 105, of whom only 20 are needed to handle all sails. The remaining 85 crewmembers serve passenger needs or are on support duties, such as in the engine room. The officers, staff, and crew are international, coming from 24 countries: the captain and 1st officer usually have a lot of tall ship experience; the cruise director, our host, Attila Denes, from Hungary, and others from India, Philippines, the Caribbean, and various countries in Europe. A sail maker is part of the ship's crew, with special sewing machine always available at sea, ready for use when the wind tears sails occasionally. The ship, built in 2000, has a gross tonnage of 5,000 tons compared with 2,298 gross tons for her sister ships, Star Flyer and Star Clipper. Royal Clipper has a length of 133.8 meters, a beam of 16.45 meters and a draft of only 5.83 meters. She is a fully rigged square-rigger with 42 sails (26 square sails, 11 staysails, four jibs and one gaff-rigged spanker) and 5,050 sq. meter of sail area. There are five masts, the tallest of which is 60.04 meter above the waterline. Also, the two tallest masts are hinged so that the mast tops may easily be cranked lower by 5.79 meters to allow clear passage under low bridges and power lines without interfering with the ship's standing rigging. The aft pair serves also as conduits for engine smoke, and discharging exhaust high above the stern, far away from any passenger space. The Royal Clipper is traditional in every way, but is updated with sea proven technology. She does not use computers for sail handling. But, at the same time, no crewmember ever needs to climb the masts to handle sails. All sails are raised, lowered and positioned from the security of the deck by skilled sailors who use power winches and hand controlled horizontal and vertical power furling. For example, square sails are opened and furled by a horizontal furling system devised for Star Flyer and Star Clipper, and now proven by years of service. Her skilled sailors, looking up from the deck toward the squaresail involved, operate a delicate electric pulser that hydraulically rolls out each sail in turn from its hollow aluminium yardarm, or furls it, as required. This is repeated until all square sails on each mast are in place. Also, a bracing platform place one step higher is equipped with a power winch at the base of each mast. This device serves to brace or shift the angle simultaneously of every square sail on that mast, and the Royal Clipper is the first ship which has an innovative system that moves every yardarm in unison. As consequence, every square sail of that mast almost instantly becomes positioned precisely as the captain wishes, so all are "square" with the wind, or slightly angled if that is more desirable. 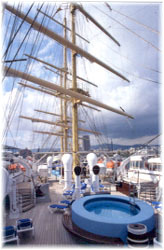 Royal Clipper is fitted with stainless steel standing rigging, which is the primary support system for all the masts. This quality investment is expensive initially, but is the right choice because it never rusts, lasts almost indefinitely at sea, weighs less than alternatives, and offers less wind resistance. This system secures all the masts to each other fore and aft near or at their tops, and links them firmly as a unit from the bowsprit and to the stern. The ship's running rigging gives support to each mast against sideways strain. It is made of galvanized steel, fitted to adjustable stout placement at the rails opposite each mast, and also includes very strong Dacron ropes running straight up each mast to form the halyards that raise, lower and secure the staysails, jib sails and the spanker with the invaluable help of electric and hand powered winches. Other rope halyards at each mast form slanting rope ladders, or ratlines, that permits climbing up each mast as required for maintenance or for repairs or for passenger use. All 42 sails are of finest quality Dacron, a modern material lighter and easier to handle than the old canvas. All are tailored especially for this ship by Doyle Ploch Sailmakers, a Florida based specialist, who have made all the sails for Star Clippers since 1991. All sail stitching is especially resistant to weakening caused by tropical sunshine, and all but one sail (it was too large) were designed by computer. So much Dacron was needed, the biggest sail order ever placed for a single ship, that the supply in the United States was exhausted and some Dacron had to be imported from Europe. As a consequence of the above-mentioned devices, the Royal Clipper is always comfortable and safe sailing under sail, with speeds between 8 to 20 knots, (depending on wind conditions). The heeling is minimum, usually less than 6 %, maintained by anti-roll tanks located in the double bottom and by the prudent control over how many sails are being used. The tanks also keep the vessel steady at anchor. When the winds fail, as they do occasionally, Royal Clipper sustains 13.5 knots with a diesel mechanical plant, fitted with two Caterpillar 3516 engines, each rated at 1,865 Kw. They are coupled to a reduction gear, which transmits power to a four bladed controllable pitch propeller. Its blades are remotely controlled from the bridge wings, or from a stern control station on the Sun Deck. It is possible to lay the propeller blades almost flat against the hull when the vessel goes into sailing mode, largely eliminating unacceptable resistance to the flow of water along the sleek sailboat hull. For optimum manoeuvrability, a 370 kW bow thruster has been fitted, and is also controlled from the bridge wings. Electric power is derived from two 1,200 kW diesel generators and also from a 1.200 kW shaft generator coupled with one of her main engines. 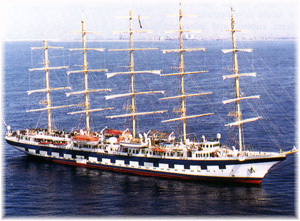 The Royal Clipper can also sail without her main diesel engines, in a so-called diesel electric mode. The shaft generator can act also as an electric motor. The two diesel generators feed it with electric power, and in this mode the Royal Clipper can sail at four knots, enough to maintain steerageway economically and quietly. The entire ship is air-conditioned, and is fitted with a reverse osmosis plant capable of make 120 tns. of potable water from the sea. The ship has 700 sprinklers and 60 spray heads; electrically-powered tender boarding platforms; lowering and stowing gangways; powered navigational equipment, communication systems, all lights, anchor windlasses, and a cargo elevator system flush mounted on deck on the bow just forward of the bridge. The elevator stops at every deck and is used for passenger luggage, for supplies, and for boarding foodstuffs of every kind. Ship's garbage, never touched aboard ship and kept in a cold room , is transferred to deck via the electric elevator. A tried and trusted ship's boom and tackle crane as in the old days transfers all cargo between ship and pier. The Royal Clipper has approximately 1,800 sq. meters of hand crafted Burma teak outside decks, located both on the Sun Deck and on the Main Deck. So, there are almost 9 square meters of open deck space per passenger, believed to be far more than found on any conventional cruise ship. The Sun Deck begins before the bridge and extends to the stern, creating a vast open area. All three swimming pools are located here. This area is also used for promenading, for reading in a deck chair, for sunbathing, etc and mainly to observe the actions of the sailors on the sails, in the three-staysail handling power winch stations, unobtrusively located along the starboard rail. The winches, old fashion ventilators, brass bell, wooden accessories and the anchors chains clutter the deck, and form the atmosphere of a real sailing ship. But the use of stainless steel, heavily utilised in many high-maintenance areas throughout the exterior of Royal Clipper, gives also a sense of modernity. The open bridge policy means also a better contact with the crew who are sailing the vessel. From the Sun deck the passenger can climb to lookout stations which are mounted some 18-meter above that deck. This place provides passengers with panoramic views of the ocean; the deck is teak, and has a high safety rail and a comfortable teak settee to observing all the action below on the sun Deck and the unlimited vistas of the sea. All passengers must use safety harnesses to climb aloft. Some passengers may also crawl into the Widow's net, under the bowsprit, and lay there bounding over the waves while the vessels bow cuts the water. The watch officer must give permission when anyone wishes to crawl on to the Widow's Net at any time. 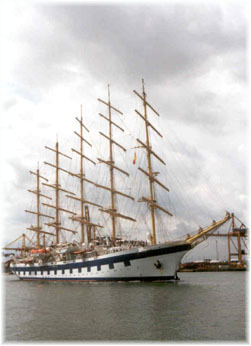 The Royal Clipper has two specially designed fibreglass tenders. Each twin-powered craft can accommodate 150 passengers at 12 knots, and are used routinely to ferry passengers between the anchored ship and a pier ashore. Every passenger aboard can be accommodated in a single trip of the two crafts. Also available are another two 60-passenger semi-flat bottom beach tenders that have been designed especially for shallow water access to the beaches. Here, the passengers can enjoy a lot of activities, such as snorkelling, swimming and for crew-staffed barbecues. On the sundeck there are three outdoor swimming pools. All the sides are stepped to allow passengers to sit around the pools. The sides also house jet nozzles to act as a Jacuzzi. The main pool, 7.31 meters in length, has a glass bottom which also acts as the ceiling of the atrium located below. The pool has ten specially designed side portholes, that direct sunlight three decks down to the Dining Room. This pool uses either salt or fresh water and is heated as desired. Also, the passengers can swim at sea thanks to an aft marina platform, which can be lowered from a flush position under the clipper stern when the ship anchors for beach calls. An interior stair provides access to the marina. The floating platform is a splendid way to safely swim or scuba dive in the sea or to board the small boats of the ship's fleet. There is also banana boat rides for the children. Also recessed both sides into the hull are two tender boarding Platforms, a stout steel platform for easy boarding of tenders for shore visits, amidships. When lowered, these devices give better wind protection for ease of tender handling. The platform is accessed through the aluminium gangway, which is lowered from the corresponding side of the Main Deck. When the ship is alongside a pier, the boarding platform is recessed, and the gangway is lowered to the pier. All cabins and suites were designed by Donald Starkey, and made by the Ippo-Kampos, a Greek company who pre-fabricated all in their own workshops, dis-assembled them, and shipped them to the Merwede yard for installation aboard ship. Star Clippers sell eight categories of passenger accommodation on board. The most expensive are the two Owner's Suites. Each measure 30 square meter, and are located aft on the Clipper deck with their own private interior stairway access from the Main Deck. Both have double bedrooms with their own whirlpool bathtub, a mini-bar, a separate seating area, and a separate double sleeping area with adjacent bath. The Owner's Suites may be joined together with a connecting door. Butler cabin service is available 24 hours. Also, there are fourteen suites, each measuring 23.69 square meters, located on the main deck, and these feature the first private balconies on any sailing ship. The teak decked balcony overlooks the sea and has ample room for a pair of chairs and a table for outdoor relaxing or dining. There is a large double bed, convertible to two single beds, with adjacent seating area with a mini-bar, overlooking the balcony through a large window. The large marble bath has its own tub and whirlpool, and the suites have been finished with the better dark woods, marine prints and brass decorative accessories. The suites are accessed through a red-carpeted central corridor that also connects to the Observation Lounge and the Piano Lounge. All suites have names of famous sailing ships. There is also an adjacent special pantry exclusively for the suites. Butler suite service is available 24 hour. The Royal Clipper has a capacity of 227 (double occupancy). All cabins, divided between the main deck, Commodore deck and Clipper deck, are doubles, of which 32 have a third pullman type berth. All are outside except for six inside cabins. There is a card entry to all accommodation. The cabin décor is most upscale and yacht-like traditional, and all cabins have TV and satellite telephone. Aft main deck there are two outside cabins, each is 16,25 square meters (the same surface as the largest available on the former Star Flyer and Star Clipper). These two cabins face each other, and have cabin doors that open onto the deck. Both are located just abaft the Library, with a large window both in the stern and in the side, with great sea views over the rail. Each has a double bed, two chairs, and has a full whirlpool-equipped marble bath and a mini-bar. 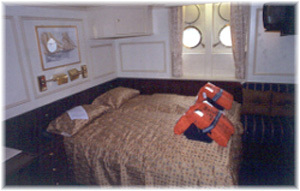 The ninety outside double cabins are either on the Clipper Deck or the Commodore Deck and measure about 13.74 square meters. They are very spacious by sailing ship standards. All have the same layout, and are dressed in traditional polished dark woods, with brass accessories and marine prints. Each bed has an innerspring mattress, as does every passenger bed aboard. The passengers control cabin temperature and air intake. There are only six inside double cabins, each measures 10 square meters and each has all the facilities of the outside cabins. There is a fixed double bed as well as an extra single bed that stores out of the way during the day. No true sailing ship ever has had an atrium, and Donald Starkey, who has designed all the interiors and the furnishings through out the new ship, has created one on a grand scale, three decks high, with cheerful appeal and usefulness. Handsome wooden furniture abounds in the Royal Clipper, like in an Edwardian yacht-like fashion, and the modern concept of the atrium acts as a contrast. The ceiling of the atrium is also the bottom of the main swimming pool, designed to allow sunlight to filter through to the lower decks. Daytime sunshine is replaced at night with twinkly atrium lighting that sparkles everywhere. 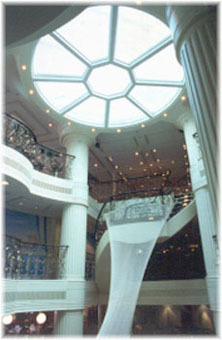 The atrium begins in the centre of the piano lounge, on the main deck. A spiralling open-sided staircase clings to the atrium's perimeter, accessing retail shops forward and aft on the intermediate deck (clipper deck), with good blue sea scene murals, and finally ending at the heart of the dining room three decks down. There are also four white moulded classical decoration tall pillars. Soft music reaches down to the Dining Room from the Piano Lounge above. The space is elegant, but may be out of place on such type of casual ship. The dining room has an annular layout and the tables, for two, four, six and eight people are arranged around a buffet table, located in the center of the room. The decoration is a nautical theme, with blue carpet, red upholstery, nautical paintings, bulls-eye portholes, etc. There is ample room for all 250 passengers and officers in open seating, with smoking and non-smoking areas of the dining room, including a small and intimate dining room for private parties located aft starboard. There are three levels, the lowest being at the centre of the room: this central area has a lot of headroom due the atrium. But in the sides, the ceiling is low, and the feeling of space is lost. Each level is separated from the other only by a step, with graceful open metal balustrades in between. However, the separation between the tables is wood and etched glass. There is also here a good wine display. All dining room chairs have easy access for service by the waiters and wine stewards. The resulting atmosphere is festive and uncrowded. Also this room has a casual atmosphere (for example, there isn't captain table), and the size of the room never intimidates passengers. The acoustics also are good and you can hear your neighbours without effort, even when the dining room is full. The relatively quiet entertainment required by Star Clipper's clientele is provided on board by lounges, bars and the library. There are no casino or show lounges on board. The roomy piano lounge is the main indoor public space, located on the main deck, on the higher level of the atrium. It shares the same traditional nautical fashion of the dining room, with blue and yellow tapestry and dark wood which contrasts with metal filigree. There are also paintings of sailing vessels and brass light fixtures throughout. The portholes fitted to both sides also add to the nautical charm. This space is also used as a meeting room when necessary. The piano bar can easily accommodate everyone aboard. Also, it is usually used in conjunction with the outdoor tropical bar, and the access between the two is made very easy to promote passenger flow. The familiar ivory coloured piano is positioned between the two aft pillars, for several concerts a day. There is a permanent dance floor, cosy cocktail tables with waiter service from the bar aft and from the pantry forward, and padded bar stools that are secured to the polished metal scrollwork of the open railing that overlooks the atrium. There is also here a 24 hour coffee dispenser and tea service. The main deck indoor-outdoor Tropical Bar and its neighbourhood Piano Lounge, are the heart of the ship. This is the first place where all passengers arrive when boarding the ship and the tropical bar, with its long marble and wooden counter, and the adjacent large open deck, which extends aft until the Library, forms the epicentre of the ship. This area is usually open air, but can be quickly enclosed thanks to a canvas top and side awnings, stored under the Sun Deck that overlooks this open area. The canvas is unrolled to supports placed high enough to retain an open feeling. The canvas sides have clear plastic windows to allow better outside views when raining. This imaginative device creates an air-conditioning space, useful in all weather, which is interconnected with the Library, and also includes the large Piano Lounge. Here, the musicians play before and after dinner, and the passengers usually gather together there. 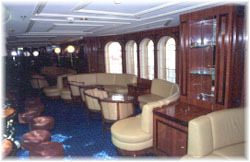 Located on the main deck aft of the tropical bar there is a quiet, warmly decorated, polished dark mahogany lounge which is used as a library. Big windows lookout to sea both sides, and softly lit marine paintings adorn the walls. With a capacity of about 50, it is ideal for soft conversations and small meetings, but mainly for quiet reading with comfortable upholstered sofas and traditional reading tables. It also doubles as a card room. The space has a handsome dummy fireplace located in the centre of the aft wall, flanked by extensive bookshelves that richly add colour to the chamber. There is also a PC for passenger use. The observation lounge is located under the wheelhouse, and is imaginatively designed for all weather comfortable surveillance forward, through picture windows that overlook action on the forecastle as well as offering a great view of the seas. But the sheer of the ship in her forward section means that it lacks a horizontal floor, and also reduces the views. It doubles also for cocktail receptions for 90 passengers at a time, for lectures, and as a lounge for reading and conversation. It is less restrained in design than the hushed Library. It also has a PC for passenger use. The navigation bridge is open always to Royal Clipper's passengers, and this is another attraction of this ship: the crew shares with the passengers the sailing experience, and this means a richer cruise experience. The mixing between crew and passengers during the evening is encouraged with the availability of the tropical lounge to all. Another first for any ship is an underwater lounge, called Captain Nemo, equipped with thick glass portholes allowing the observation of sea life and ocean bottom (thanks also to hull spot lights) when the ship is anchored. The passengers can also enjoy drinks in a juice bar with comfortable lounge seats, while observing the marine world. This area doubles as a Spa area, with a fitness room, a unisex hair salon, a massage room and the skin and body treatment centre. This room also has a nautical flavour, with lots of wood everywhere, but there is a problem here: the headroom is very low and the ceiling surface is mainly mirrors, in an effort to give it more sense of space. Also, the decoration of the access staircase, a Captain Nemo scene mural, doesn't go with the traditional ambiance found on board. The ship sails in the Mediterranean in the summer from May until October and in the Caribbean in the winter. In her first two Mediterranean seasons, she offered two alternative itineraries: Cannes to Sardinia, Corsica, Livorno, Portovenere. Monte Carlo; and Cannes to Menorca, Majorca, Barcelona, Cap Creus, St. Tropéz. But in the next 2003 Mediterranean season, she will sail from Civitavecchia to Malta and Italy. The Caribbean itineraries go from Barbados to either St Lucia, Iles des Saintes, Antigua, St. Kitts, Dominica, and Martinique or to Curacoa, Grenada, Tobago Cays, St. Vincent, Bequia, St. Lucia, and Martinique. The Star Clipper ships have a 70 percent return rate. Most of her passenger just stayed on the top deck and enjoyed the fresh sea air and the joy of sailing. They don't like the usual activities found on standard cruise ships. But Star Clippers look for other markets. They also cultivate the family market, which come mostly in the summer and at holidays, and there are a lot of kids' activities. The Royal Clipper and the other Star Clipper ships are often chartered by corporations and they are available for meetings at sea as well as for off-shore accommodation during special events. The Royal Clipper has an extra scale and luxury over her fleet mates. So, she will attract passengers who have yet to experience true cruising under sail, but in a casual ambiance. The best part of a cruise on the Royal Clipper is the sailing, not the ship, and the best way to enjoy it is to take a test cruise.